Notice how the subtle panels of this period vinyl door complement the horizontal brick work of this charming entry. Talk about curb appeal! The 19th Century styling of this entryway is common to the American East Coast and South, but with vinyl, you can duplicate this decor anywhere in the country. 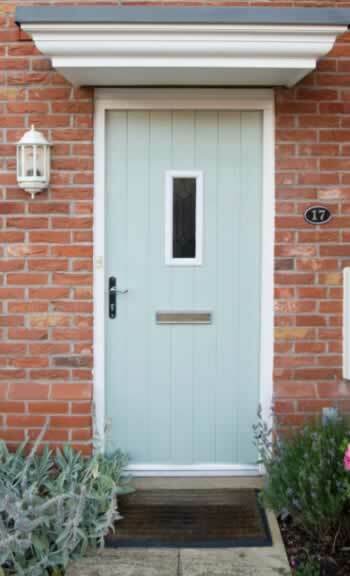 At first glance, your visitors will be sure you've installed wooden period doors. But you know that you're enjoying the perfect combination of appearance with the unique qualities of low-maintenance and sound-proofing that comes with vinyl. You can also include in-door insulation that will drive down your heating and air conditioning bills throughout the year. In this example, the door is designed to complement, rather than detract from, the brick and mortar exterior. Add tiles in the entry, period lamps on the walls, greenery, and period hardware and you have a winner!